You are looking at a silver medal for blameless service in the police. The Medal was first instituted in December 1876 during the reign of Tsar Alexander II. 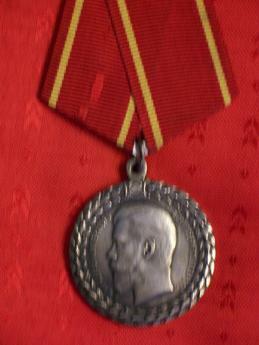 After the death of Emperor Alexander III the Medal was redesigned and issued around 1894 bearing the semblance of the new Sovereign, Tsar Nicholas II. The obverse of the silver medal bears the truncated bust of Tsar Nicholas II facing left encircled by an inscription meaning: "By the Grace of God Nicholas II Emperor and Autocrat of All Russias". 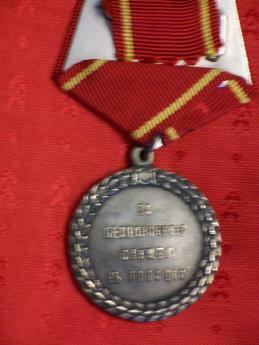 The reverse of the medal is plain, except for an inscription signifying: "For Blameless Service in the police".